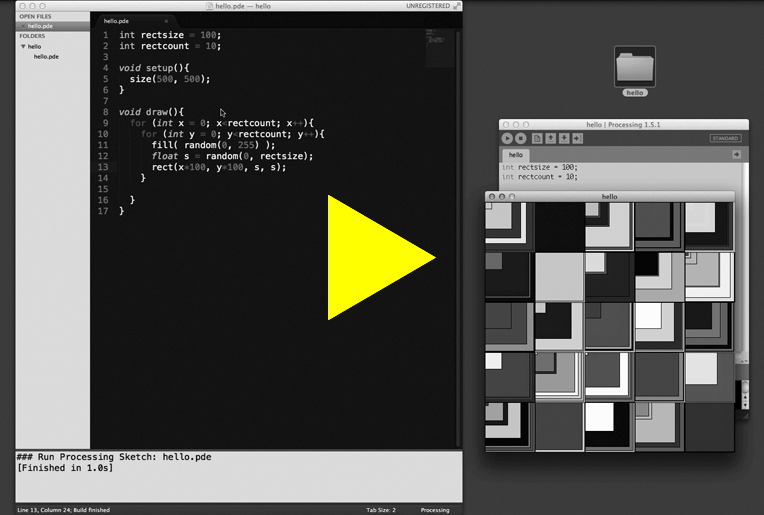 A Processing package for Sublime Text 2 and 3. Check the demo video on vimeo! Please note: you must have at least (>=Processing 2.0b6), otherwise the build system of the this package won't work. The video is a bit outdated, you don't have to run any longer the Processing.app in parallel to run sketches. If you have to use an old Processing version (e.g. 1.5.1), you can use version 1.0 of this package. Use Processing's Tools > Install “processing-java” menu item after you have installed Processing. This package assumes that you chose to install processing-java for all users (recommended). If you choose to install processing-java only in your home directory, then you have to slightly change the build script, see the comment in the file Processing.sublime-build. In the “System Properties” window, click on the Advanced tab. In the “Advanced” section, click the Environment Variables button. Edit the “Path” variable. Append the processing path (e.g. ;C:\Program Files\Processing-2.0b6\) to the variable value. Each entry is separated with a semicolon. Or, write a separate build system as documented in this comment. If you are using Sublime Package Control, you can easily install the Processing Package via the Sublime Text > Preferences > Package Control: Install Package menu item. Alternatively you can install the package and keep up to date by cloning the repo directly into your Sublime Text Packages directory. Download the files using the GitHub .zip download option. Unzip the file and rename the directory to Processing. Copy the directory to your Sublime Text Packages directory e.g. OS X: ~/Library/Application Support/Sublime Text 2/Packages/Processing. In Sublime Text, select the Tools > Build System > Processing menu item. In Sublime Text, select your main .pde file and use ⌘B to run the sketch. The build system expects that your sketch follows the normal directory structure and naming conventions of a Processing sketch (e.g. mysketch/mysketch.pde). With ⇧⌘B and typing build, you can select alternative build systems, such as Run sketch fullscreen and various Export sketch options. To get .pde files to run with ⌘R and ⇧⌘R (like Processing) instead of ⌘B and ⇧⌘B, add the following code to the User Key Bindings file via the Preferences > Key Bindings - User menu item in Sublime Text. Console error messages are clickable: e.g. double click test.pde:10:0:10:0: The function rEEct(int, int, int, int) does not exist to jump to the related line and file. Want a “Pure Java” Project without Eclipse? Complex projects often lead people into using Processing with Eclipse. If you want to stick with Sublime Text, but want a “pure Java” Processing project and the convenience of a fast “build and run” workflow, try creating a project with the New Java Ant Project command (see issue 61) and run your sketch with the Ant build system. Make sure that the variable DEFAULT_PROCESSING_LIBRARY_PATH within the file Processing.py inside this package matches your installation of Processing. If you are on OS X and Processing.app is in the Applications directory, then you do not need to edit this. Despite this, OS X users may need to install the Fix Mac Path package, due to the way Sublime manages environment variables such as PATH. Create an empty directory (folder) for your new project, and open that empty directory in Sublime. Use either the menu item Tools > Processing > New Java Ant Project or select the Processing: New Java Ant Project command from the command pallete (⇧⌘P). Specify a Java package name for your source code (e.g. com.myorg.myapp). Use the Tools > Build System > Ant menu item to ensure that Ant is the active build system. Use ⌘B to build and run your sketch. Out of the box, you should see a full screen app that displays the default 200x200px gray sketch, which is the Processing default. You can now implement setup and draw, add additional classes to your sketch, and run it with ⌘B. Just be sure that Ant is the active build system. If you are new to Sublime I recommend the Perfect Workflow in Sublime Text tutorial. If you are short of time, then make sure to at least watch Multiple Cursors and Incremental Search (~6min), highly recommended! See the contributing guide to learn about how to contribute to this project.